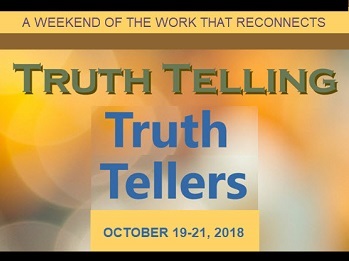 Registration is now open for Truth Telling, Truth Tellers, a weekend of the Work That Reconnects, October 19-21, in Deerfield, MA. This annual Interhelp Gathering is open to all, whether you have journeyed the Spiral many times, or you are new to the work. Details here. Please see below for more events and news of Interhelp projects (including our micro-grant program). Also below: “Elevator Speech.” We hope you will contribute to our conversation: How do you describe Work That Reconnects events? Just out: the latest issue of Deep Times: A Journal of the Work That Reconnects. It’s a rich issue, woven around the theme of “deep time.” I strongly recommend this review of Bob Stilger’s AfterNow: When We Cannot See the Future, Where Do We Begin? Beloved mother, father, lover, earth, our larger self, our greater body, we’re so grateful to be granted a human life right now at this time of such anguish, turmoil, when so much suffering and loss is occurring. We’re so grateful to be given human identity and a human voice so we can take part in human councils. Help us to be evermore fully aware of the blessings of being part of your intelligence. So be it. Open to anyone who’s done any kind of Work That Reconnects workshop. Please reply to John MacDougall. Facilitation Support: Monthly facilitator support calls, for WTR facilitators in the NE US, are underway, generally on the second Monday. Contact Joseph Rotella. Micro-Grant Program: Seed funding is available to support WTR offerings in our region! We are especially seeking programs or projects that touch on or emphasize: engaging young people; de-centering whiteness; developing a Community of Practice; or creating a “bridge” with another group. In our March Interhelp newsletter, we invited feedback on our new Community Guidelines for Tending and Mending the Social Web. In response we’ve made some important changes, and will be continuing our re-vision and editing process later this summer. We’d love to receive your input. Our second Community Practice Day (in which we reflect on and practice implementing these guidelines) is in the works, likely for September. If you are interested, let us know, and we can include you in our scheduling process. Welcome to the members of our newly formed “Repair Circle”: Eleanor Mathews, Joyce Reeves and Markie Babbott. They bring a wealth of skill in interpersonal communication and conflict resolution. Should a hurt or conflict arise within workshop/community space, they will assist in resolution and healing as needed. Thank you! In a workshop we come into solidarity with other folks who are realizing the depth of the situation we’re in, and that it’s important to come together and be together. It’s something I found that works for me. It helped me move from overwhelm and despair to finding my place, focusing my energy. Everybody is stressed: this is a technology for understanding that others are going through the horrible pain we all feel. Life-enhancing solutions everyone can participate in; a way to find your place in the work for a life-sustaining society. We break through denial, numbness, and distraction (people get that our culture entertains us to death). The Work That Reconnects is a body of group exercises, meditations, and philosophical writings….. It provides tools for maintaining energy, inspiration and connection….. It works on emotional and spiritual levels…..
We learn to respond to the world situation with heart and soul as well as our minds. The workshops help activists and other caring people – from any tradition, secular or spiritual – draw strength and courage from their inner resources, and from each other.